petition: #FreeShahidulAlam Allow journalists to do their job! #FreeShahidulAlam Allow journalists to do their job! Background, added by Care2: "Alam has been detained by the police. The one and only reason he was arrested is that he gave an interview to al-Jazeera in which he expressed views critical of the Bangladeshi regime&apos;s brutal repression of public demonstrations in Dhaka, and had allegedly posted equally critical statements on Facebook. Alam&apos;s arrest must be seen in the context of the ongoing commission of illegal and violent acts perpetrated against demonstrators by the government and its extra-governmental actors. These acts include the use of rubber bullets fired indiscriminatingly into crowds, alleged rapes, and killings. International NGOs such as Unicef and Amnesty International have issued statements condemning this, and others will surely follow suit. A free press is a fundamental and essential element of all democracies. Its repression cannot be taken as anything but the efforts of authoritarian regimes to deny the world insight into its operations and policies. The attack on Alam at once brutalises this person and destroys the right to a free press. We condemn his unjust treatment unequivocally." - from open letter published in The Guardian. We strongly believe in the freedom of the press and the safety for all journalists. The most recent attack and atrocity is the detention of Shahidul Alam, Bangladeshi photographer, activist and founder of Drik, Pathshala South Asian Media Institute and Chobi Mela International Photography Festival. We collectively demand that Shahidul Alam be released immediately as he has the right to freedom of expression. #ShahidulAlam’s bail application is to be heard tomorrow. We need 700 more signatures to make this 50,000. Can you help? It will help to get their attention. If we each can get one more signature for this petition, we can reach 100k and deliver it to the new US ambassador to Bangladesh and the BD embassy in the US. -Shahidul Alam has been imprisoned by the Bangladeshi Government. -Bulgarian Viktoria Marinova was raped and murdered. If we do not speak out NOW we are complicit with the censoring of our right to freedom of speech. We are up to 15,000 signatures and it hasn't made a difference....yet! Photo District News has published a helpful list of people to write directly to. Please add your voice? IT IS ALSO IMPORTANT TO INCLUDE VOICES OUTSIDE OF THE PHOTO COMMUNITY. With 8,616 signatures, we have been able to sustain the attention to #freeShahidulAlam. Can we make it 10,000 by Monday, when there will be the next hearing? I share this often with the US Bangladeshi Embassy and the officials in Dhaka. As many of you have asked, I do know Shahidul. He was an early supporter of my photography and an inspiration. I have also taught at Pathshala in Dhaka. This is both personal and political as I also strongly believe in freedom of speech. 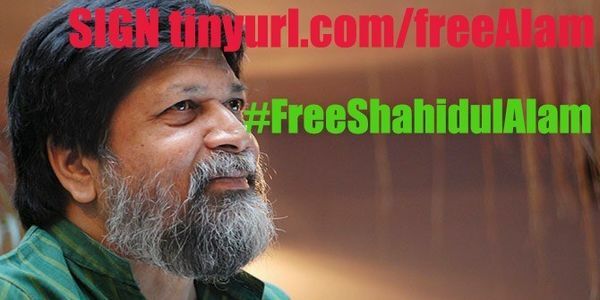 For updates about Shahidul join the #freeShahidulAlam group on Facebook. I have received a contact at the Bangladesh Embassy in the USA. When we reach 2,000 (which I hope happens today) I will share this with them. If any of you have other suggestions to maximize this petition, please email me directly.